Our experts agree: there is no "one size fits all" approach when it comes to the health of your landscape. Each year, your unique landscape’s needs may change, so we adjust our fertilization and weed control program accordingly. Rice’s proven 4-Step Lawn Fertilization Process keeps your soil healthy, so grass grows in full and even. Delivered as part of our Estate Landscape Management service, this is perhaps the most important part of your lawn maintenance strategy. This cycle begins with crabgrass preventer, followed by weed deterrent, lawn food and finally, an application of our special winterizer to support a healthy return in the spring. Together, these lawn care processes help keep your yard lush and healthy all year long. Step 1. Crabgrass Preventer: We start the cycle by applying our powerful crabgrass preventer on dry grass during March, April or May. It helps stop crabgrass before it invades your yard, and protects against regrowth all season long. Step 2. Weed & Feed: In May or June, we apply our Weed & Feed solution on wet grass to kill dandelions and other pesky summer weeds. Our weed control helps your lawn grow strong roots and improves its ability to absorb nutrients and water. Step 3. Lawn Food: In July or August, we apply a layer of our dry lawn food to keep your landscape nourished throughout the hot and dry summer months. Your grass grows in full and lush and crowds out unwanted weeds. Its root structure is strong and deep to survive the winter ahead. Step 4. 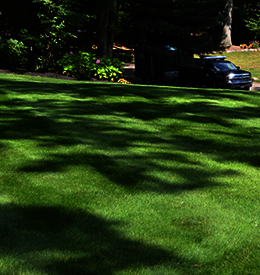 Winterizer: Applying winterizer during the fall is the most beneficial step in lawn care. Winterizer offers the potassium and nitrogen necessary to nourish your landscape throughout the cold winter months, preparing it for regrowth in the spring. To learn more about how Rice’s can care for your landscape all season long, fill out the form below to request a free quote.